The Essential Baking Company’s third bakery cafe opened this morning in Georgetown, joining sister-shops in Wallingford and Madison Valley. The folks at Essential are celebrating by handing out complimentary bites of the certified-organic bakery’s signature brownies at their newest store at 5601 First Avenue South — while they last. Of course, it would be nice if you’d be a sport and buy something from the Essential bread basket, or even show up for lunch (they’re keeping tradesman’s hours: Mondays-Fridays 6:45 a.m.-2:15 p.m.). P.S. the cafe’s expanded menu focuses on something new from founder and head-baker George DePasquale: pizza. 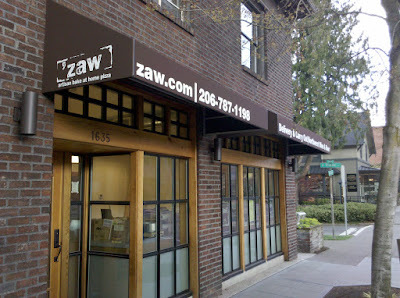 Speaking of pizza, ‘Zaw, the artisan bake at home pizza joint with a trio of stores — on Capitol Hill, South Lake Union and in Ballard — is opening a fourth take-out and delivery shop at 1635 Queen Anne Avenue North. “We started training in the store last night,” co-founder Greg Waring told me today, and after pounding a few more nails tonight, operators should be standing by for your order in time for the Saturday debut. Or you can order on-line. 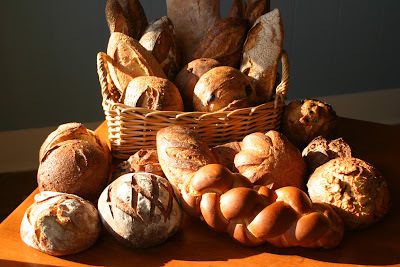 ‘Zaw keeps things local, seasonal and green and uses Bob’s Red Mill organic flours (Bob, love you!) for their ‘zaws (traditional, whole-wheat or gluten-free). If you need beer and wine, they’ll (gulp) deliver — by bike. Don’t like taking and baking? Keep an eye out at area farmers markets for the ‘Zaw booth and try a slice — you’ll find them at the Ballard Sunday Market this weekend. Queen Anne store hours: 2 p.m.-9:30 p.m. Sundays-Thursdays, 2-10 p.m. Fridays-Saturdays.